Your pet has been good all year so treat them to something special by selecting from these lists of the top 10 gifts for cats and dogs. Looking for the perfect gift for the cat or dog lover in your life? Try an EntirelyPets gift card or check out our Products for Pet Lovers. Scroll through the products below to find the right gift for your kitty! Nothing says “home” like a full-size sisal scratching post. This incredible post stands at a whopping 32 inches to accommodate even the largest of cats. This durable post stands the test of time and provides the perfect outlet for spirited felines. For cats that love to bask in the sun, provide the perfect place with this portable platform. This perch can attach to your windowsill with a simple adhesive strip or with a more permanent screw mount. The sill also includes an added heating element to keep your kitten cozy. Provide a practical gift with this stainless steel pet fountain. The Drinkwell 360 entices your cat to stay hydrated with a moving stream and filters water to keep it fresh and clean. This is the perfect gift to keep your cat healthy and hydrated, inspiring him to drink the proper amount of water. The ideal toy does more than keep your cat happy- it provides a bonding experience that brings you and your cat closer together. The Go Cat Catcher teaser toy allows you and your cat to enjoy innumerable sessions of interactive play, keeping you both happy for years to come. Nothing says “I Love You” like making it official with a custom engraved ID tag. Essential for any pet, an up-to-date tag is vital to ensuring that your cat always finds his way home. Place your contact information and your cat’s name to solidify your bond. Indoor cats need exercise, too, and it can be difficult to stimulate their minds and bodies from within the confines of your home. Provide a safe way to explore the outdoors with the Come with Me Kitty Harness and Bungee Leash. Provide a safe space for your cat with this foldable fabric tunnel. In addition to providing a small, cozy space that cats love, this tunnel is made with an electrostatic material that works to keep your cat clean, capturing hair and dirt as your pet rests in the tunnel or passes through it. Our cats may wish to play more than our schedule allows. Fret not for those unfortunate felines, for the FroliCat Dart offers a fabulous solution. This automated play toy uses a rotating laser to send your kitty running around the room to keep him active and happy. Bringing your cat in to the vet or out and about can be straining to some cats. Reduce the struggle and increase your kitty’s comfort with this lightweight stroller. The stroller is collapsible for easy transport and features a zip top to keep your cat contained in its ventilated cabin. One of the most universally loved cat treats on the market is the all-natural, succulent Bonito fillet. Kitty Kuisine includes fillets that are carved paper thin to create a texture your kitten will love while providing a rich source of taurine that will keep him healthy! You can also make your kitten’s holiday complete by placing these gifts in his very own stocking! This holiday stocking is adorned with an adorable mice pattern and even includes 6 catnip-laced mouse toys for added fun. The stocking measures 10-inches long to allow for plenty of stocking stuffers! You can also keep your cat’s stomach calm in spite of the stress and strange scraps that the holiday often brings. Try Proflora for Cats to keep your cat’s stomach and digestive system healthy and regular throughout the holiday season. Is your cat on the naughty list? Try these great behavioral products! 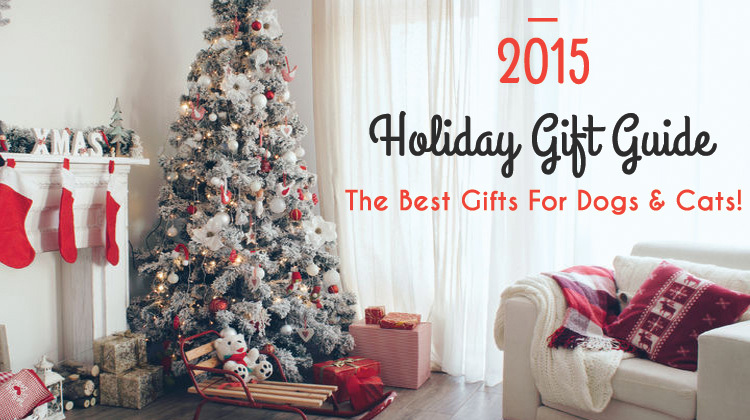 Scroll through the products below to find the right gift for your pup! Dogs love to lounge and you’ve never known appreciation until you’ve provided your pup with the perfect place to do just that. This K&H Couch offers a comfortable resting spot for curling up with their favorite bone or for getting some much needed sleep after a play-filled day. Speaking of the perfect bone, your dog will go absolutely wild for this delectable smoked ham bone. Hickory smoked for a rich, full flavor- this bone provides hours of pleasure for your pooch. Unlike many other treats, this bone is also made here in the USA! This festive thinking dog’s plush toy provides a full set of toys in one puzzle product. The Hide-A-Squirrel includes a base that contains three small plush squirrels, each of which is adorned with a celebratory Santa hat and loaded with an exciting squeaker to keep your dog enthralled. For pets that prefer a more engaging toy, the iFetch ensures that they always have a partner that’s willing to accommodate their eager need to chase and retrieve. This automated ball launcher operates with an AC adapter or 3 C batteries and includes 3 custom tennis balls. Dogs love bones, but there’s something extra special about a chew that’s completely edible. These irresistible pig ears provide an all-natural chew that is easily digested to provide a safe chew snack that is rich in savory flavor. Keeping your canine warm throughout the winter season is no easy task, but this reindeer hoodie provides a fun and festive way to keep him cozy. Available in 4 sizes, this cute hooded sweatshirt is made with thick, quality fabric. Bones and chew treats make excellent gifts- but their ephemeral nature leaves dogs wanting. Keep your pooch satisfied year-round with a gift that won’t give way to even aggressive chewers. This extremely durable toy is non-toxic and is available in 5 sizes to accommodate any dog. The best gift is something that not only makes your dog comfortable, but that also keeps him safe. This harness features adjustable straps made with durable nylon to securely fasten your dog into any vehicle with its versatile tether and buckle attachment. This tether can also be removed so the harness can be used for regular walks and runs. As for additional solutions that keep your dog comfortable and safe, this microwave heat pad is great for keeping your pup warm and for relieving sore or aching muscles and joints. The pad heats up in only 5 minutes to provide up to 10 hours of warmth. Why settle for one gift when you can provide a full set that is designed just for the holidays. This stocking set includes four delightful toys that are designed to fit perfectly in a standard stocking. The pack includes a plush squeak Santa, a braided rope, and two tennis balls. Whether you need a stocking for the aforementioned stocking stuffer pack or you simply want to provide your pooch with his own place over the fire, the Kyjen Plush Puppies Holiday Stockings offers a soft plush stocking that has plenty of room to hold your pet’s presents. And as for helping your dog make it through the treats and scraps he’s sure to consume throughout this festive seasons, Proflora offers both treats and powder to help settle your pup’s stomach. Try these delectable soft chews today! Is your dog on the naughty list? Try these popular calming solutions today!